High in potassium and rich in seaside protein, this dish will make your RealAge 5.1 days younger. In a medium bowl, combine soy sauce and vinegar. Transfer ¼ cup of the mixture to a medium saucepan; set aside. Toss scallops with remaining soy sauce mixture and 1/4 teaspoon of sesame oil in a bowl; let marinade at room temperature 10 minutes while preparing vegetables. Meanwhile, add 3/4 cup water to the soy sauce mixture in saucepan; bring to a simmer. Stir in couscous and prunes. Cover; remove from heat and let stand 5 minutes or until liquid is absorbed. Heat a large nonstick skillet over medium-high heat until hot. Add half the olive oil to the hot skillet, and transfer scallops from marinade to hot skillet; reserve marinade. Cook scallops on one side for only 2 minutes, (do not turn over) or until glazed; transfer scallops and juices from skillet to a bowl or plate; set aside. Add the reserved olive oil to the skillet. Add bell pepper and squash; stir-fry 3 minutes. Add reserved marinade from bowl; cook 1 minute. 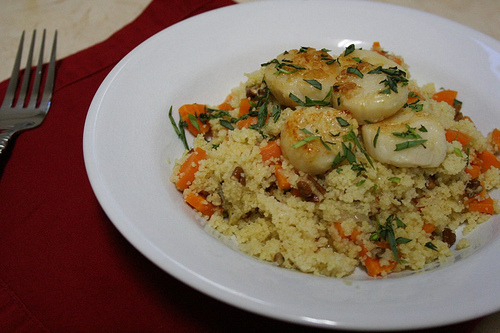 Add reserved scallops with juices; stir-fry 1 to 2 minutes or until scallops are opaque and vegetables are crisp-tender. Stir mint into couscous; transfer to four serving plates. Top with scallop mixture, drizzle with reserved sesame oil and serve with additional soy sauce, if desired. Rinse sea scallops in cold water and pat dry with paper towels before marinating: They will take the marinade more readily and will caramelize in the pan to a beautiful golden brown. Zucchini or yellow summer squash may replace the baby pattypan squash, and dried apricots may replace the prunes. To reduce the sodium further, use half as much soy sauce, and dilute with water.